Last week set the stage for an epic battle between Coulson and Ward. What's going to happen? How will this mid-season finale totally wreck our feels? Let's find out. Spoilers! Agents of S.H.I.E.L.D. contains PG-13 level violence. This episode in particular contains some disturbing images. On the blue planet, Ward pressures Fitz to figure out where the portal is going to open. Fitz tries to get Ward’s gun, and Ward punches Fitz down a sand dune. Ward joins him at the bottom, saying that if Ward doesn’t make it back through the portal, Simmons will be killed very slowly. Fitz retaliates by saying the only reason Malick sent Ward through this portal was because Ward is expendable. After Coulson dive bombs into the portal, Bobbi and Hunter return to the plane. Mack asks if they want to tell him what Coulson was thinking. Bobbi and Hunter tell Mack that the only way to get Coulson and their team members back is to attack the castle. Daisy radios, asking them to come talk to her. She’s been keeping tabs on the Hydra castle, and they’ve just gotten a bunch of crates full of Inhumans. Mack tells them about the plan to break into the castle. 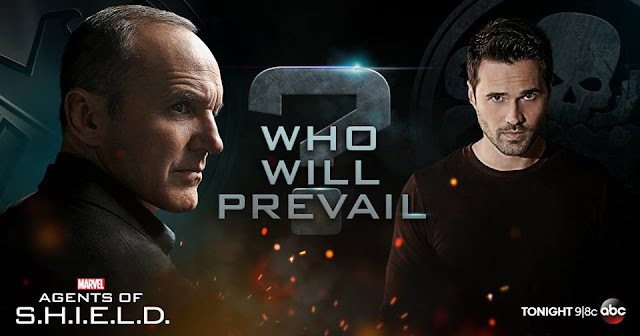 Joey asks if the plan is saving Coulson, saving the Inhumans, or attacking Hydra... or if there’s a combo of all three. Hunter tells him this is what S.H.I.E.L.D. is like--making a plan and finding out your plan is rubbish, like right now. So they start making a new plan, with everyone giving their input. Mack uses his new role as Director to put his foot down, telling them definitively what plan they’re going to follow. He says they need to sneak into the castle using stealth. He divides them into two teams. May, Daisy, Joey, and Lincoln need to search the castle for Fitz or Simmons. Mack, Bobbi, and Hunter will be securing the portal. At the compound, Malick tells Giyera that the Inhumans are a gift for Death. (They mentioned this in previous episodes, but this was a helpful reminder since I totally forgot. Thanks for having my back, Agents of S.H.I.E.L.D. writers.) They give an estimated time for when the portal will open, but Jemma corrects them. When Malick thanks her, she says she’s only doing it so Fitz can get back safely. Malick says that Death is the only thing returning--Fitz is just there as an offering to show him the door. Back on the plane, Daisy discovers that there are aqueducts under the castle that they can use to get into the Hydra castle. Fitz and Ward keep walking on the blue planet, and Fitz is turning to a splendid defense mechanism: sarcasm. He’s sassing Ward off when he suddenly locates Will’s hatch in the middle of the ground. Before Ward can do anything, Fitz jumps down it and wakes Will up. Will immediately recognizes Fitz. Unfortunately, Ward follows them down. He confronts Fitz, about to kill Will, but Fitz says that Will serves a purpose: to be their guide. Coulson dreams about Rosalind. They’re laying in bed together, sunlight flooding through the window. Rosalind pressures him to get up, which startles Coulson awake on the blue planet. He takes in his surroundings, particularly the giant moon/planet/thing in the sky. We see Coulson get on his feet, and he pulls out a gun. As he does this, threatening music plays. I’m not really sure why this is supposed to be threatening. Coulson goes to an absolutely unknown planet that inhabits Death, and we’re surprised he has a weapon? Then again, it does hammer home just how serious Coulson is about taking down Ward. At the Hydra castle, our infiltration teams break into the aqueduct, using Joey’s powers to melt the metal grate. Inside the castle, Jemma has a knife, and she’s working on breaking free. Our teams have split off, and May, Daisy, Lincoln, and Joey are hidden, scoping out the area. Lincoln and Joey are nervous, as one normally is when thrown into a sudden combat situation. Daisy tries to reassure them. May asks Lincoln to make the power at the compound go out, so he does. This provides the distraction needed for Jemma to escape. Ward, Fitz, Will, and Ward’s soldiers are on the move again, heading to find Death and the next portal’s location. As they walk, Fitz fills Will in on everything that’s happened, including the fact that Hydra still exists. They realize they’re both bleeding--Fitz from his head, Will from his leg. Then they indirectly address the fact that they’re both Jemma’s love interests. It’s very awkward. Fitz says he imagined this scenario very differently. Will says he can see why Jemma loves him. They then mention that they need to lose Ward. Will tells Fitz to follow his lead, then starts leading their group through an ominous-looking canyon. Jemma is sneaking through the Hydra compound. She locates the crates full of Inhumans, then sees their container module. She turns it on and finds Garner inside, who pleads to be let out. She fills him in on what’s going on, but she’s reluctant to let him out. He thinks they handed him over to Hydra on purpose, which Jemma refutes, but Garner’s still mad that May shot him. He tries to bargain with Jemma, saying that he’ll protect her. They get interrupted by armed Hydra guards, so Jemma hurriedly lets him out. He kills the Hydra guards as Jemma listens. Elsewhere, Coulson troops through the desert, following the footprints of Ward and his gang. Will and Ward chat about the octopus statue seen earlier, and Ward tells Will that the Inhuman contagion is spreading back on earth. He’s not thrilled, but he’s running with it. They’re interrupted by a huge sandstorm, and it’s revealed that they’re in the No Fly Zone. At the Hydra compound, Mack, Hunter, and Bobbi are making progress. The sandstorm is still raging, and Will uses this as a cover to start picking off Ward’s soldiers one-by-one. He and Fitz manage to escape. Jemma runs into May, who saves her from a Hydra guard. Jemma informs May that Andrew is here, saying that they could find him. May shakes her head, saying that this isn’t the mission. She radios Daisy, saying that she has Jemma and they’re heading Daisy’s way. The one who fired the shots is none other than Coulson. They talk, a fair bit of animosity between them. Ward says Fitz will die because the monster can smell blood... and Fitz is bleeding. Coulson punches Ward and says now Ward is bleeding too. He then says that Ward is going to lead the way, presumably to both Death and Fitz. Jemma hugs Daisy, then is reunited with the whole team, who are excited to see her. They work on securing a haphazard mini-base by the portal. They discuss how they’re not sure exactly who will come through the portal, something that concerns Lincoln especially. (I mean... it’s a valid concern... but no, Lincoln.) Suddenly they realize that May has snuck away to find Garner. May goes to the space where the crates full of Inhumans were. All of the Inhumans have been brutally killed by Lash. 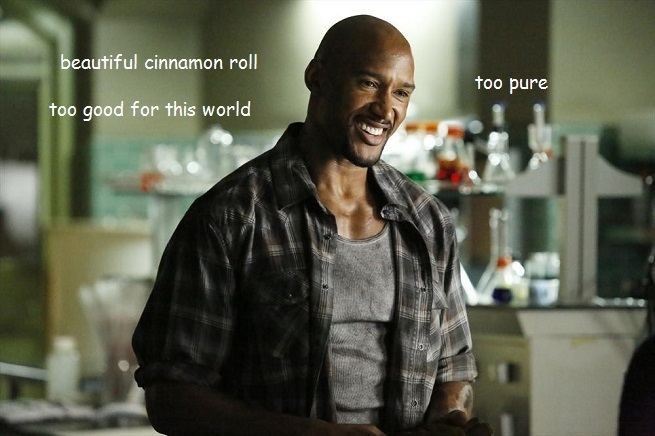 Ward tries to talk Coulson down. He says he’s been where Coulson is now. Ward says he chose Hydra initially for petty reasons, but seeing the Hydra statue gave his life meaning. He feels the satisfaction he never got through revenge. Coulson isn’t having any of it and shoots Ward in the arm, saying that it feels pretty satisfying to him. Ward continues talking about the planet. Ward says the fact that Coulson is here on the planet with him and that this all is happening confirms that Ward is part of a grand plan. 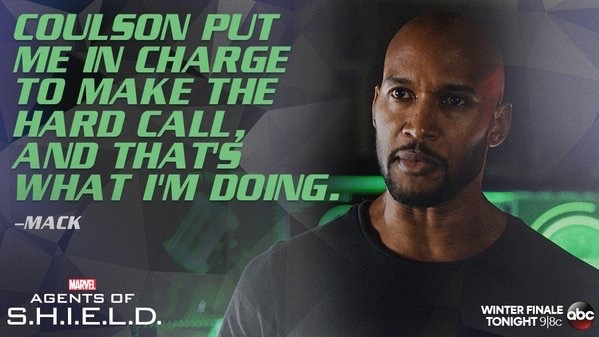 Coulson doesn’t understand this at all, but Ward says he will. Back on earth, they discuss the potential of Death coming through the portal. Mack is skeptical about all of this. Jemma discusses the blue planet and how desolate it was. She thinks that Death was responsible for this desolation. Lincoln says they should destroy the portal. Daisy brings up the other Inhumans at the compound that they need to save, but May shows up, bearing the news of the Inhumans’ massacre. Malick has discovered that all of this is going down. (Where was he the past hour or so?) He tells a soldier that they have less than fifteen minutes to regain control of the portal. Coulson and Ward locate Fitz and Will, who are fast-tracking it to the portal. Coulson tells Ward they need to move. Back at the Hydra compound, Hydra is trying to break into the portal room. The whole team tries to formulate a plan, but Mack overrides them with his plan: all of them need to leave, but he will stay. If Death or anything nasty comes through, Mack will send them an order to fire missiles at the castle. All of the team members resist this, but Mack puts his foot down as Director, giving an impassioned speech. Okay. So yeah, I get it, you don’t want to lose all your best agents. BUT YOU ARE THE BEST AGENT, MACK. Daisy agrees with Mack, except for one thing. She says she’ll stay because a.) she can keep the portal open and b.) she’s his partner. Will brings up the awkwardness of the whole Jemma-love-triangle situation again, but Fitz says he doesn’t care, he just wants to get off this godforsaken planet. They find the ruins of an ancient civilization, which Jemma didn’t get a chance to see, and Fitz snaps photos of it like an adorable tourist. Will falls down because of his leg, so they pause. Will takes this opportunity to give Fitz a history lesson about the planet. He says there were once nine cities, whose residents were highly advanced beings who feared change. They ended up destroying each other. Fitz asks him how he knows so much, then looks at Will’s leg, which is bony and... overall, not good. Fitz realizes that who he’s talking to is not Will, and Not-Will says that Will died saving Jemma... from him. So, basically... Death has possessed Will’s body. Not-Will kicks Fitz down, and they fight. Not-Will gains the upper hand. Back on the plane, Bobbi and May begin preparations for possibly firing missiles at Mack and Daisy. On the blue planet, Not-Will raises a boulder, ready to smash Fitz, but Coulson fires at him just before he does. Not-Will falls to the ground. Unfortunately, this gives Ward the upper hand, and he and Coulson start fighting, too. On earth, there’s one minute left to the portal opening. It liquefies in preparation. Daisy gets guns, one for herself and one for Mack. Ward and Coulson duke it out. Not-Will suddenly stands to his feet. Fitz grabs a gun and fires several round at him, which don’t kill him. On the plane, all of S.H.I.E.L.D.’s best agents watch the situation unfolding on a handy-dandy screen. In this moment, we are all glued to our TVs just like them. May arms the missiles, ready to fire on the Hydra castle in case things go badly. Daisy has been holding open the portal, but it’s too much for her--they’re running out of time. She gets a nosebleed and passes out into Mack’s arms. On the blue planet, the portal is open. Fitz screams at Coulson, saying they have to go. Coulson looks down at Ward, who pleads for his life. A flash of Rosalind’s face appears in Coulson’s brain, reminding him of the reason he came across planets to find Ward in the first place. Slowly, painfully, Coulson pushes on Ward’s chest with his bionic arm, crushing his rib cage with a sickening crack. Ward is dead. And the emotion I feel is not satisfaction. It’s sadness. Coulson takes off his bionic arm and tosses it next to Ward’s lifeless body, then heads off towards the portal. As he does, some absolutely disgusting slug-thing slithers out of Not-Will’s face. On earth, Mack tells May to fire the missiles. After a few really suspenseful moments of hesitation, she deploys the missiles. They land on the castle, which crumbles. Suddenly, the containment module flies upward, containing Mack and the rest of the team. They’re safe. They arrive back on the plane, and we see so many emotional reunions. Bobbi embraces Mack, while Fitz and Jemma go into each other’s arms. Daisy and Lincoln reunite and share a slow kiss. Phil and Melinda hug. Jemma’s face falls as she realizes that Will isn’t on the containment module. Fitz wraps her in a hug. Across the room, he and Coulson share a look: the only two people who know what happened on the blue planet. The look on Coulson’s face is a little haunting and concerns me. In the very last scene, Malick managed to escape the Hydra compound. In the middle of the road, someone stops him. This someone is wearing Army fatigues... and he’s holding a detached bionic arm. The camera slowly pans up to reveal a pale, dark-eyed version of Ward. The slug-like thing, Death itself, crawls under Ward’s skin. It turns out something awful came through the portal after all. As you probably remember, season two’s mid-season finale was earth-shattering (pretty much literally). I was wondering how they were going to outdo it this season, and I do have to say they succeeded. Last week, I read some fan theories speculating that Will was actually Death and that Death would also possess Ward’s body. So unfortunately, I wasn’t very surprised by this twist of events. However, the way they went down was honestly chilling, and Agents of S.H.I.E.L.D. has reached new heights with this episode. I have conflicting emotions about Ward’s death. I really enjoyed the complexity his character this season, which is weird for me to say. I was kind of hoping he’d stick around (though I will not miss the destruction and awful things he kept leaving behind). I also was sad to see one of the original agents die. Even though I knew it wouldn’t be easy for Ward to get redemption from his actions, I was still kind of hoping we’d get to see him have that somehow. While I’m sad that Ward’s character is dead, I’m absolutely thrilled that we essentially get a zombie (!!!). This is combining one of my favorite things with an already awesome show. The sight of the alien crawling under Ward’s skin sufficiently creeped me out. Though he’s not technically a zombie in the truest sense, Ward’s reanimated body looked just like something I’d see on The Walking Dead. I’m super excited by this plot twist. Some of my favorite parts of this episode were the humor, which was on point and made me laugh out loud at several points. I loved seeing Mack, who has grown and blossomed so much since he arrived on the show. Additionally, I liked seeing Joey and Lincoln stretch their wings. Their involvement also seems like the beginnings of Daisy’s Secret Warriors. I’m wondering and hoping that they expand on the Secret Warriors plot line in the latter half of season three. There are lots of things to spice up season three, as well. Lash is still a threat, and he’s out there somewhere. Additionally, the horror that everyone wanted to prevent from coming to earth is here, and no one knows about it, except the new head of Hydra, Gideon Malick. This can’t end well. In addition, I’m worried about Coulson. He’s taken a dark turn, and I’m not looking forward to seeing how his choice to kill Ward (as well as his loss of Rosalind) affects him--and Fitz, for that matter. All in all, there are so many things to worry about! I’m so stressed. And we have to wait for several months to find out. So in summation, RIP, Ward. And, um, I will try my best to prepare for the ramifications of... whatever this is. Good luck getting through till March 8th, fellow Agents of S.H.I.E.L.D. fans. I’ll see you on the flip side. Did you see “Maveth”? What did you think of it?